Cambodia has a strong tradition of craftsmanship due to economic rehabilitation programs that were initiated in the 1980s, which offered the population incentives for this type of authentic work. Although Cambodia does not have large shopping malls, the central alleys that cross through Phnom Penh offer lots of different markets where you can find unique and charming antiques, handcrafted gifts, silks and silverware, as well as imitation goods. The best-known markets tend to be open at night, such as Sisowath Quay, the Olympic market (located next to the stadium), the Russian market and the Central Market. 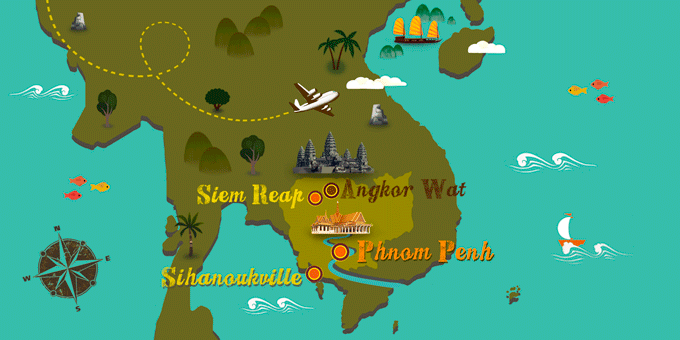 Another option is Siem Reap, which has a variety of souvenir markets in its center and many beautiful handcrafted products that are made by the Angkor Crafts Association. A custom found here, as in the rest of Southeast Asia, is haggling, so the cost always declines from the initial price tag.